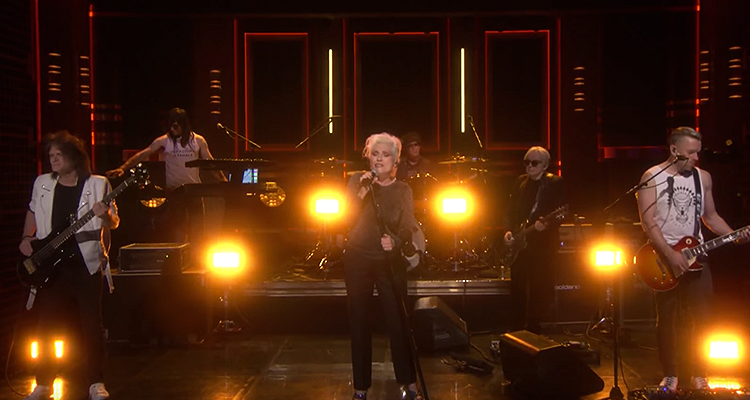 Watch Blondie Light Up 'Fallon' With New Single "Long Time"
Blondie’s eleventh studio album Pollinator dropped this past Friday and last night the burgeoning new wave act took the stage on Jimmy Fallon’s The Tonight Show to perform “Long Time,” the LP’s rousing second single. Front-woman Debbie Harry effortlessly swooned the live studio audience with the euphoric new-disco-tinged melody. “I’ve been running circles round a night that never ends / I’ve been chasing heartache, in a city and a friend / I’ve been with you so long, even seen you lose it, but, who cares?,” Harry playfully sang in the pre-chorus. Watch below. Blondie’s “Fun” topped the Billboard Dance Club Songs chart last week, marking the band’s first No. 1 charter in 22 years. “Our collaboration with [“Fun” co-writer] Dave Sitek has turned out to be totally wonderful; couldn’t be much better than a No. 1. Dancing is the most ‘fun’,” Harry told Billboard.